The following statement is from the Energy and Climate Change Coalition regarding legislation introduced by Senate Majority Leader Reid. 2) job creation in minority communities and expanded economic opportunities for minority-owned businesses. Policies that create jobs and ensure small business opportunities for minorities in the energy and clean technology sectors, including federal and state incentives and requirements to promote diversity in hiring, procurement, contracting and access to capital. Education and training programs to prepare minorities for careers and business ownership in the array of services and technologies necessary to develop and deliver cleaner, more diverse, domestic energy sources. Public awareness and outreach initiatives aimed at developing energy efficiency and conservation programs for minority and low- and fixed-income communities, thereby lowering greenhouse gas emissions. Resources and incentives for vulnerable communities to help them adapt to climate change impacts and transition to lower-carbon economies, while ensuring environmental justice protections. The ECC Coalition plans to examine the proposal closely in the coming days and weeks, with a focus on the opportunities and implications for people of color and low/fixed income persons. This perspective is one that is not often directly represented at the decision making table. We look forward to working with Senator Reid, his colleagues in the Senate and other Members of Congress and the White House, to shape this important legislation and to make our voice heard. Message from Rev. 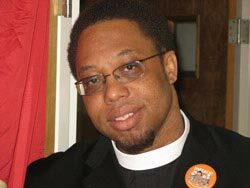 Lennox Yearwood, Jr.
On August 28, 2005 Hurricane Katrina hit the shores of the Gulf Coast, and in the morning of the 29th, the levees broke flooding the city of New Orleans. As we know, due in large part to government's failed response, an estimated 2,000 plus people died, and hundreds of thousands of people were displaced.This August 29th, 2010, will be the five year anniversary of Hurricane Katrina. 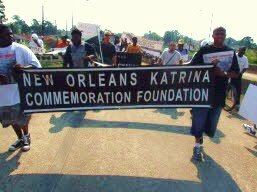 As many Gulf Coast residents continue to cope with an uncertain future, we are mobilizing for the 5th Annual Hurricane Katrina Commemoration March and Rally in honor of those who passed in the storm and the community that was abandoned by a failed government response. Join us for the March and Rally on August 29th in New Orleans, find out more about the event and RSVP here. Make a tax-deductible DONATION to the support the Rally and March. SIGN OUR PETITION to restore and rebuild New Orleans and the Gulf Coast. Have your organization ENDORSE the March and Rally. Spread the word through TWITTER and FACEBOOK. Yesterday I published this article about why we should all get involved in the 5 Year Hurricane Katrina Anniversary. August 28th, 1963 was the historic March on Washington, when Dr. Martin Luther King Jr. gave his "I have a Dream" speech. August 28th, 1955 was the day Emmitt Till was murdered in Mississippi, which catalyzed the Civil Rights movement. Then, on August 28th , 2005 we had Hurricane Katrina hit the shores of the Gulf Coast, and on August 29th the levees in New Orleans broke. This is our moment. It has been 5 years, and the damage of Hurricane Katrina and a failed government response has not been made right. Help make it right. Take actions 1 through 5 above, or whichever you are able to do. Spread the word - For Future Generations. 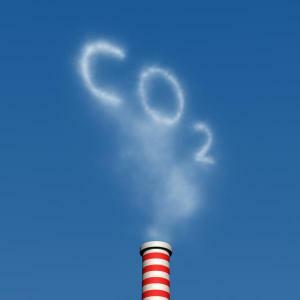 Our good friends at the National Black Chamber of Commerce (NBCC) are opposing California's AB 32 (The Global Warming Solutions Act), which, in our opinion will ensure that state greenhouse gas emission reductions are achieved while maintaining the competitiveness of California businesses and protecting the interests of consumers and workers. We believe the law will unleash that good old American ingenuity that will actually increase the creation of jobs and spur economic activity. "...the implementation of AB 32 would cost tens of billions of dollars in higher electricity bills, gasoline, food and other products. The average California family would end up paying $3,857 more every year for housing, transportation, food and energy. Businesses would be severely affected as well, including the small firms that create the vast majority of new jobs. The cost of AB 32 would average out to almost $50,000 per small businesses in California, a hit many of them couldn't survive." 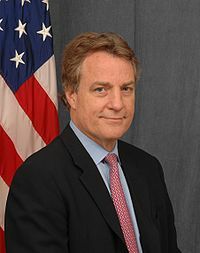 "We can't afford to lose more jobs here, particularly for African-Americans, Hispanics and other people of color who have already suffered greatly during the economic downturn. The California economy has shed 1.3 million jobs since 2007, and our unemployment rate is the third highest in the nation, at 12.4 percent. More than 900,000 job seekers have been out of work at least 27 weeks, the largest number of long-term unemployed registered since record keeping began in 1990. But African-Americans and Hispanics are out of work in much larger numbers, hit hard by the housing market collapse and other factors. The unemployment rate for California Hispanics is estimated at 17 percent. Last March the National Urban League estimated that nationwide unemployment among African-Americans was nearly twice that of whites." "Where should we go from here? 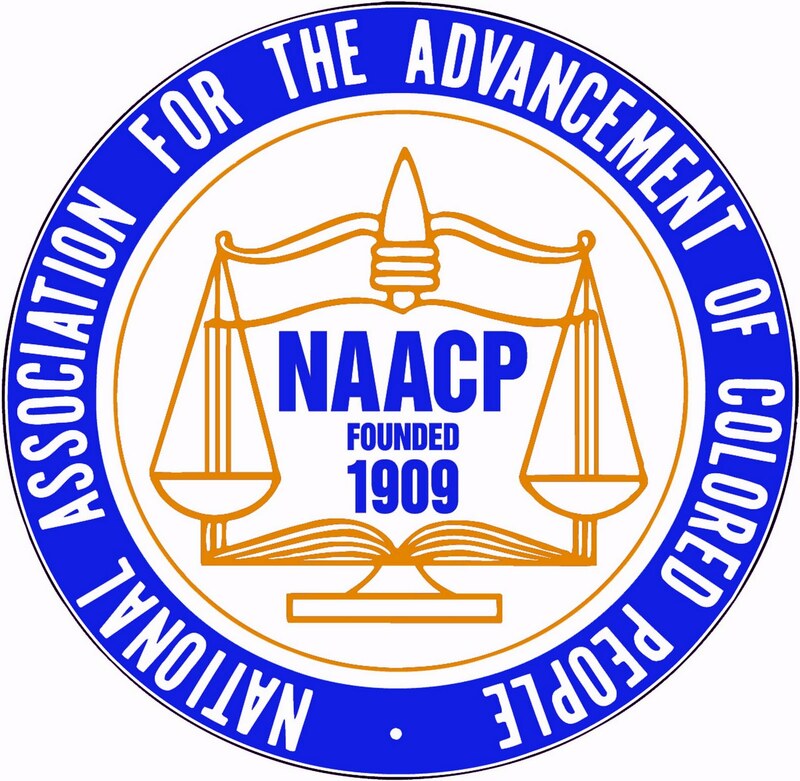 Beyond our continuing obligation to assist those African-Americans still in need, government-directed diversity programs should end." AAEA exists because African Americans are still in need. 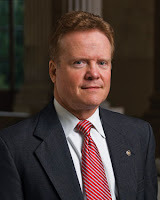 We challenge Senator Webb to explain his way out of why Blacks do not own any energy infrastructure or resources in the United States. 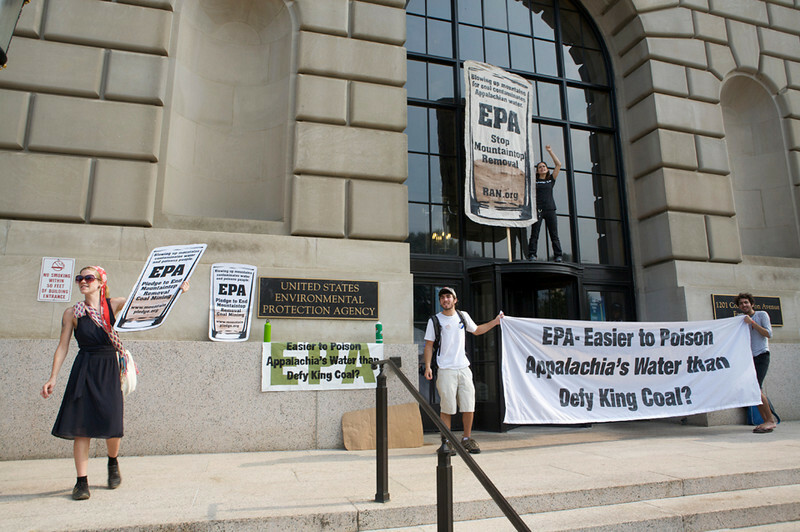 AAEA has been promoting such ownership for years and all we have found are doors closed and locked. We have found resistance to allowing African American ownership where such partnering would help the firm(s) get approval for projects and they still refuse to include Blacks. The only companies that get significant contracts for goods and services are affirmative action-registered minority and women-owned business enterprises [8(a) firms at the federal level]. Without these government 'set-aside' programs, Blacks would be largely shut out in the energy and environment marketplace. The energy sector is a closed shop to Blacks. "Nondiscrimination laws should be applied equally among all citizens, including those who happen to be white. The need for inclusiveness in our society is undeniable and irreversible, both in our markets and in our communities. Our government should be in the business of enabling opportunity for all, not in picking winners. It can do so by ensuring that artificial distinctions such as race do not determine outcomes." Whites COMPLETELY own the infrastructure and resources in the energy sector. They do not have to worry about being discriminated against. Blacks are the ones shut out in what has to be considered a major imperfection in the energy marketplace. Where such imperfections exist, it is the perfect function of government to correct them. The Department of the Interior (DOI), Office of Civil Rights, is sponsoring a Conference Forum for DOI Employees in conjunction with the Blacks in Government (BIG) National Training Conference on Tuesday, August 17, 2010, from 8:00 a.m. to 5:00 p.m., at the Kansas City Convention Center, H. Roe Bartle Hall, 201 West 13th Street, Kansas City, Missouri. The Forum is being co-hosted by the Bureau of Reclamation, Lower Colorado Region. The theme is “Renew, Respect, Restore.” The agenda includes a diversity training module titled Generations: Renew, Respect, Restore, which will be conducted by diversity consultant Dr. Wanda M. Costen. 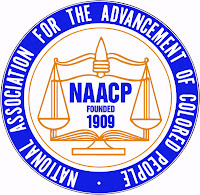 The Blacks In Government 32nd Annual National Training Conference (NTC) will be held in Kansas City, Missouri from August 16-20, 2010 at the Kansas City Convention Center. This year’s conference theme, “The New Big: Taking Chances, Making Changes, And Preparing Leaders,” will highlight recent changes in public service, as well as prepare employees to successfully manage their careers. The NTC is endorsed by Government agencies at the Federal, State, and Local jurisdictions. The NTC also affords conferees an opportunity to strategically focus on enhancing their required core competencies and thereby, promotes career development and advancement. The NTC is a nationwide response to train and develop individuals into subject-matter experts, so that they will be able to perform the critical tasks of providing services to the general public. Areas of training include technology, health care, science, equal employment opportunity, acquisition, financial management, project management, retirement planning, homeland security, and many other service-based functions necessary for the general welfare of the citizenry, and inclusive of programs benefits. BIG is a 501(c)3 non-profit organization, whose members are civil servants throughout all levels of government and private industry. BIG was Incorporated in 1976 as an employee advocacy and professional development association and held its first NTC in 1979. BIG is committed to improving public service through promoting equity, excellence, and opportunity in the workplace. 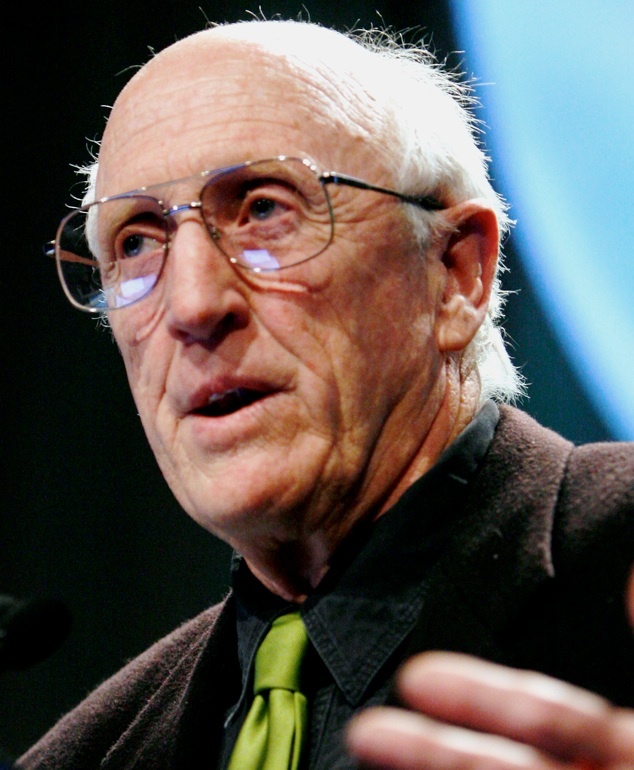 I was watching C-SPAN2TV tonight and there was Stewart Brand, right, chatting up his latest book, "Whole Earth Discipline: An Ecopragmatist Manifesto." As I watched, he started discussing his support for nuclear power. When he pictured about 10 environmentalists who switched to support nuclear power, I noticed that I was nowhere to be seen. Interesting, since I was the first environmentalist in the United States to support nuclear power. Also interesting because the Center for Environment, Commerce & Energy (and outreach arm - African American Environmentalist Association) is the only environmental organization in the United States that consistently, publicly and aggressively supports nuclear power. How did Brand miss us? How did he miss me? I have it. I have toured nuclear power plants all over the world and the radiation has rendered me invisible to certain elitist environmentalists. You know that old school and new school in the environmental movement that avoids interacting with Blacks (unless it is in the designated areas: weatherization, outreach and environmental justice). Heck, Brand even had Al Gore's picture up there and Al doesn't even support nuclear power. Oh well, I guess he and his other little elite buddies do not want me in their little club. Not unusual, because I also remember when I was the only Black professional working in the Washington, DC-based environmental movement. There still aren't a handful of Blacks working in the traditional environmental movement (unless they are in the designated areas). It leads one to think that old school environmental racism is alive and well among the green converts in the neonuclear movement. I guess what really bothers me is that I was out there alone being told I was crazy by almost everyone I know before Brand or any of his other elite buddies, and yet they pull the same old elitist environmental bull that I have seen for 30 years. "Last night the Senate again failed to pass funding for the Black farmers discrimination settlement, this time it was stripped from the war funding bill. And previously the funding failed to gain passage in the tax extenders bill and the FEMA disaster assistance bill, even though the House has already passed the settlement funding in two separate bills. It is clear that without pressure from the White House this funding will not make it through Congress. 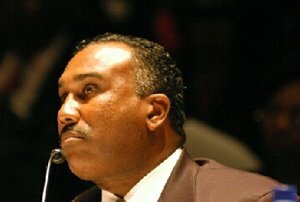 Recent events have demonstrated the swiftness with which government can act on civil rights. It is clear now that without greater White House pressure, the Senate cannot manage to keep this funding, despite its widespread support, in a larger funding measure because it continues to get grouped with other controversial add-ons. This is an unacceptable situation and must be resolved immediately. We have been told from Senate and House members, both Democrats and Republicans, that there is bipartisan support for the Black farmers settlement funding. 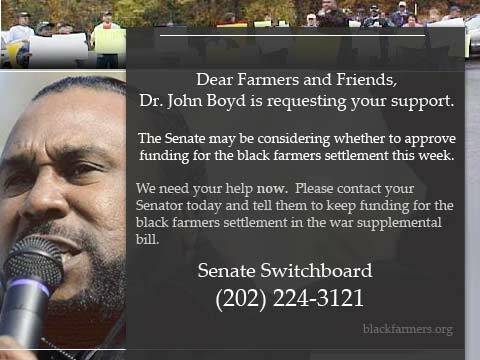 Yet, despite commitments of support and the fact the funding has already passed the House in two bills, the Senate has been unable, or perhaps even unwilling to pass the Black farmers settlement funding. I understand the election year jockeying that occurs on funding measures, but it makes no sense that the Black farmers and Native American farmers are getting caught up in it. I am concerned that Congress will not act before the settlement expires - by agreement amongst the parties it had been extended 50 days from June 29, 2010. This year I have attended the funerals of many Black farmers who passed before ever seeing this case resolved. For these reasons, I am asking our supporters in the Senate and House to introduce parallel stand-alone bills that will provide full settlement funding for the cases involving the Black farmers and Native American farmers. And I am calling on the White House to work with us and the leadership in Congress to quickly resolve these cases by passing the funding immediately. If you look on the website home page of every federal agency, you will see the No Fear Act somewhere on the page. That was placed there by Dr. Marsha Coleman Adebayo, left. 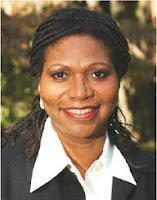 Although it has been eight years since the passage of the No Fear Act, Dr. Adebayo gives a preview of her current views on President Obama, former EPA administrator Carol Browner, current EPA Admininstrator Lisa Jackson and the situation in the Gulf of Mexico in "Black Agenda Report," that will be included in her forthcoming book and movie, "No Fear." Below are excepts from the article. "...it is possible that the day will come when vast areas of the Gulf and its coastal regions will be declared sacrifice zones. That is, areas that are so contaminated that the cost and feasibility of cleaning and restoring them to there prior state will exceed their total economic worth." "So I was more than a little surprised when the nation's first African American president, Barack Obama—who is a civil rights attorney himself—selected Ms. Browner for such a high profile position in his administration [Special Advisor to the President for Energy and the Environment]." "Given Lisa Jackson's statement about a month into the disaster “that EPA reserves the right to halt the usage of sub-surface dispersant if we conclude that at any time, the impact to the environment outweighs the benefit of dispersing oil,” it is likely that when the time comes for heads to roll to provide political cover for a besieged president, Administrator Jackson will find herself in the same sacrifice zone I encountered at EPA for her failure to take decisive action against BP (whether this was under the direction of her supervisors or not)." · Start recruitment from Historically Black Colleges & Universities. Sprint has an expanding portfolio of green devices and accessories. Currently, Sprint offers three green devices available in the U.S.: 1) Samsung Reclaim, 2) LG Remarq, and Sprint’s latest device, 3) Samsung Restore. The Samsung Restore has an eco-friendly design without sacrificing the latest technology. 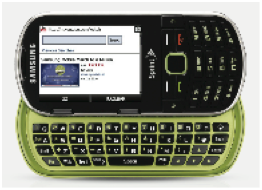 Designed with the avid texter in mind, the stylish phone boasts a QWERTY keyboard and one-step access to social networking sites, while maintaining strict environmental standards. "Community members and business owners [of color] have been locked out of access to contracts for cleanup and other opportunities related to addressing this disaster." "contractors of color are not receiving equal consideration for opportunities to participate in mitigation efforts." 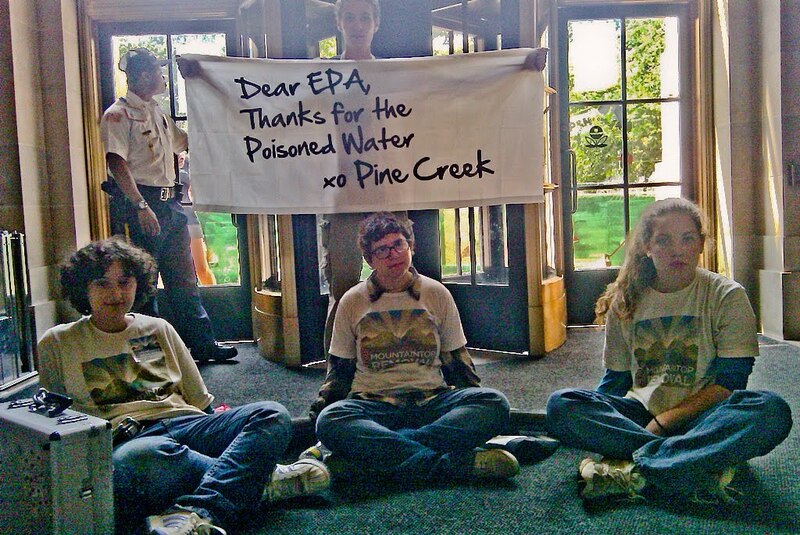 Five sit-in protesters recently occupied the Constitution Avenue entrance lobby of the EPA's headquarters in Washington, DC. 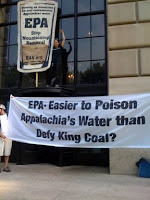 to protest the agency's approval of water permits for mountaintop removal. 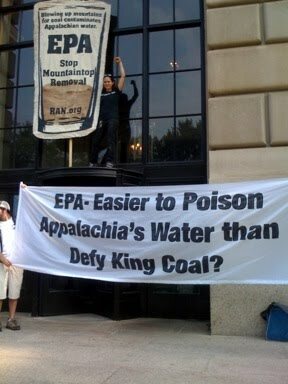 The protesters played a recording of EPA Administrator's own words stating her intent to end mountaintop removal (MTR) mining valley fills on an amplified soundtrack. The protesters locked themselves together with metal 'lock boxes,' and began to play John Denver's song 'Take me Home, Country Roads,' with intermittent sounds of Appalachia's mountains being blown apart by MTR explosives spliced into the song. Freeman Beach is a historically black-owned 180 acres of undeveloped beachfront property located at the north end of Carolina Beach. It has been owned for over 150 years by the descendents of Alexander Freeman, a notable free black man from North Carolina. During the Jim Crow years in the South, Freeman Beach was the only beach accessible to African Americans and developed rich cultural traditions and history. 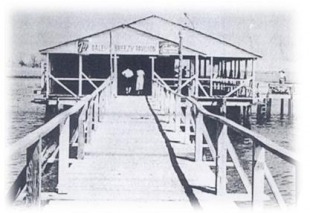 In its glory days, Freeman Beach was often called “Bop City.” People came from miles around for clam fritters, wooden dance floors, jukeboxes, and good times. Located on the southeastern coast of North Carolina, Freeman Beach was the only beach available to African-Americans in North Carolina for more than 50 years. Blacks were not permitted to swim at nearby Carolina Beach or at other beaches in the Wilmington area. Thus, Freeman Beach became the place the black community congregated to vacation, relax, and play. Freeman Beach is the namesake of the Freeman family, African-Americans who lived across the intercoastal waterway in a town called Seabreeze. The original 99 acres near Myrtle Beach Sound were bought by Alexander Freeman, a freed slave, in 1855 and grew to 180 acres by the time of his death. As the property passes to each new generation, the interests become increasingly fractionalized, resulting in a large number of people having an ownership interest in the same piece of land. Fractionalized interests in land are particularly prominent amongst African-Americans living in rural areas; approximately 80% do not have estate plans. Because of the number of heirs owning fractionalized interests in the property and the fact that tenants in common may transfer their interest at any time, families owning heirs’ property are vulnerable to losing it to developers or more affluent owners. The loss of heirs’ property commonly occurs through bankruptcy proceedings, creditors’ judgments, tax sales, foreclosure, adverse possession, and partition sales. Partition sales are a court ordered sale of land that can be forced by the action of just one party with an interest in the land. These sales result in the highest bidder becoming the property owner; it is not uncommon for the land to be sold to someone outside of the family. Furthermore, land is generally sold at a fraction of its actual value and the amount re-cooped by family members is reduced by costs associated with the sale and attorney’s fees. In October of 2008, a development company called Freeman Beach LLC filed a petition for partition, claiming they had a majority interest in the land. 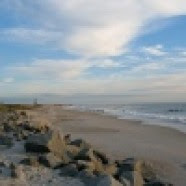 SaveFreemanBeach.com is a project of the Southern Coalition for Social Justice. U.S. Environmental Protection Agency Administrator Lisa P. Jackson returns to the gulf coast to monitor EPA’s on-the-ground response to the BP oil spill, meet with federal responders and BP representatives, and speak with residents about ongoing federal efforts to mitigate the spill’s impact on the region. She will travel to New Orleans and Pensacola, Florida. During the trip, she will be briefed by EPA and Coast Guard officials on the latest response updates and monitoring data, and oversee beach clean up efforts in the region. 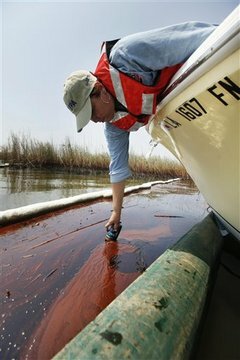 The administrator will also meet with EPA scientists in Gulf Breeze, Fla., for a briefing on ongoing dispersant testing. Administrator Jackson and EPA continue to work closely with National Incident Commander Admiral Thad Allen, who is leading the administration-wide response and directing all interagency activities. For more information on EPA’s efforts in the gulf and for the latest air, water, sediment and underwater dispersant monitoring data. 1:00 p.m. Town Hall Meeting: “Expanding the Environmental Conversation” Ernest N. Morial Convention Center 900 Convention Center Blvd New Orleans, La. 10:30 a.m. Tour of EPA’s Gulf Breeze Lab and Pensacola Beach Operations Lab Gulf Breeze and Pensacola, Florida. 1:15 p.m. Stakeholder Meeting Gulf Breeze, Florida. In 1942, Harris Neck, a thriving community of black landowners who hunted, farmed and gathered oysters, was taken by the federal government to build an WWII Army airstrip. 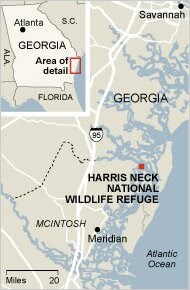 Harris Neck National Wildlife Refuge was established in 1962 by transfer of federal lands formerly managed by the Federal Aviation Administration. Now, the original landowners want to know why they cannot have it back. So does AAEA. We support transferring ownership of this land back to the original owners or their descendants. The Harris Neck Land Trust, formed by the former residents, their descendants and a handful of white families who owned land but did not live on Harris Neck, is asking Congress to return the land. 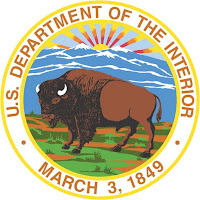 The Fish and Wildlife Service maintains that the land is a crucial part of the national refuge system. The Fish and Wildlife Service is wrong and the U.S. Department of the Interior already has serious racial problems that need to be addressed too. When the managers from the federal Fish and Wildlife Service talk about the Harris Neck National Wildlife Refuge, they speak of endangered wood stork rookeries and disappearing marsh habitat, dike maintenance and interpretive kiosks. But when the members of the Harris Neck Land Trust talk about it, they speak of injustice, racism and a place they used to call home. On its face, the quest of the former residents pits the goal of environmental conservation against that of righting a historical injustice. But it is also a conflict about two ways of life — one that tries to protect natural resources from human encroachment, the other demonstrating that humans can live in harmony with nature. AAEA is not conflicted by this at all. After the closure of the base, the land should have reverted to the original landowners. This also represents more of the historical injustices meted on Black people during the first half of the 20th Century. Harris Neck was deeded by a plantation owner to a former slave in 1865. Black families who settled there built houses and boats and started crab and oyster factories. But the community, many descendants suspect, was too independent for the comfort of McIntosh County’s whites. During World War II, when federal officials were looking for a site for an Air Force base, the county’s white political leaders led them past thousands of uninhabited acres to Harris Neck. The government condemned the land and ordered the families to clear out with the promise, some residents recall, that they could come back after the war. Blacks received an average of $26.90 per acre for the land, while whites received $37.31, according to a 1985 federal report. In 1962, the wildlife refuge was established. Trust members plan to utilize solar energy, cutting-edge sewer treatment and organic farming at the site and most of the acreage would remain wild and open to the public. But a little more than a tenth of the land would be developed — each of about 70 families would get four acres, with design requirements and a strict covenant that the land, now worth $100,000 or more an acre, could not be sold. There would be an eco-lodge and a convention center, which the county now lacks. Complicating matters is that the former residents are themselves, in a way, endangered. They are Gullah/Geechee, descendants of West African slaves who became some of the nation’s earliest black landowners. Their distinctive culture, preserved for years by isolation on the coastal barrier islands, has been threatened by development to such a degree that in 2006, Congress designated a Gullah/Geechee Cultural Heritage Corridor stretching from North Carolina to Jacksonville, Florida. Contact Representative Jack Kingston (R-GA), right, who represents the area, today and demand that he introduce and aggressive push for legislation to transfer this federally protected land to its original owners.